This article is the second in a series of four autobiographical articles by Aiki News Editor-in-chief Stanley Pranin and was first published in 1990 in Wushu, a Japanese-language magazine dealing with Chinese martial arts. 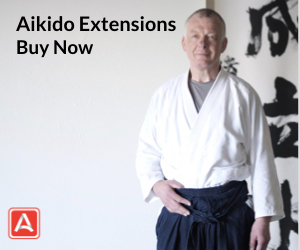 In my last article I covered the circumstances under which I began my practice of aikido in 1962 and some of my strongest memories from those first few years. I would like to pick up the thread of my narration where I left off last time. The year is 1965 and I am a student at the University of California at Los Angeles. In the intervening two years I had been promoted to ikkyu by Takahashi Sensei. Although the demands on my time for studies were heavy I managed to continue training on Fridays and weekends. Also, my interest in aikido had grown to the point that I began to take Japanese language classes as an elective at the university. At that point in time, I did most of my training at the Los Angeles Aikikai. It was one of the first dojos established in the mainland U.S. and continues to operate today. 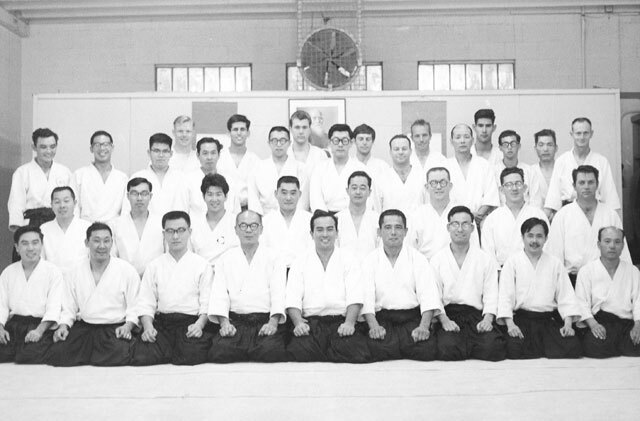 Besides the chief instructor Isao Takahashi Sensei, most of the senior students were nisei or sansei and several of them had moved to California from Hawaii where they had earlier begun their aikido training. As I recall, more than half of the dojo members were of Japanese descent. 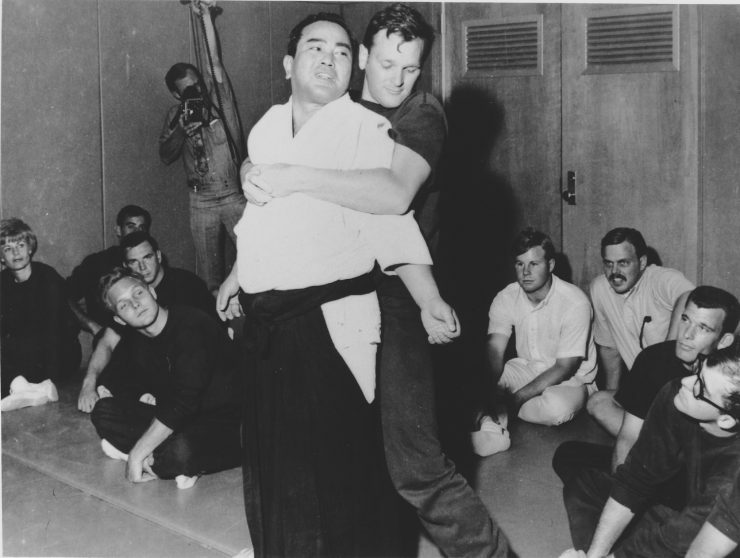 Some of those early aikidoka did much to spread aikido in California during the early years and such names as Clem Yoshida, Rod Kobayashi, Dan Mizukami, Francis Takahashi, and Daniel (Kensho) Furuya stand out most in my mind. seated front row center. To his right, Isao Takahashi. The author is standing last row, second from left. That summer at the dojo was a very exciting time for everyone as we were anticipating a visit from the Head of the Instructors’ Staff (Shihan Bucho) of the Aikikai Hombu Dojo, the famous Koichi Tohei Sensei. Tohei Sensei was at that time perhaps the most well-known aikido teacher in the west due to his frequent travels to America and the publication of his early books in English. He had introduced aikido to Hawaii in 1953 and remained there teaching for about two years. At that point in time, the image of aikido in the minds of most foreigners was primarily shaped by his concept of the art which emphasized kiand, in this sense, Tohei was more influential outside of Japan than even the Founder Morihei Ueshiba. 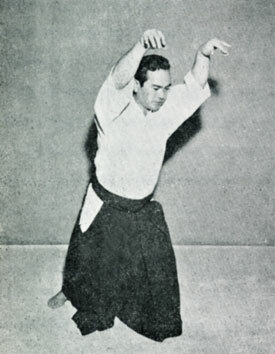 Tohei was known for his unrivaled technique, and easy-to-understand, entertaining teaching approach. 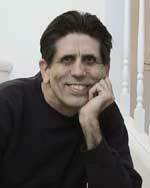 For those of us who had never met him, we were anticipating a man almost bigger than life. Koichi Tohei in New York, c. 1967. When Tohei Sensei actually walked into the dojo that warm summer day in 1965 I indeed felt a powerful presence. Since his English, though quite serviceable, was difficult to understand, one had to pay close attention to his words. 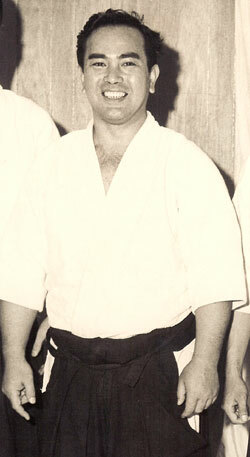 When he stepped on to the tatami to teach, he would often smile and relate amusing anecdotes to convey key points regarding techniques. 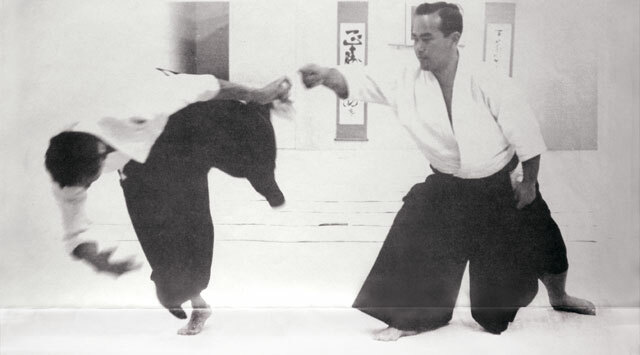 Tohei Sensei’s movements were very graceful and he would often jump or hop while executing them. Although he was heavily muscled, even a bit stout, I found his motions more dance-like than martial. At the same time, there was certainly no doubt that he had plenty of power in reserve if he ever cared to call upon it. Being raised in health-conscious California I was somewhat disappointed to find that he smoke and drank, although in retrospect having lived in this country (Japan) for many years, I now understand that there is nothing surprising about any man having such habits from the Japanese cultural standpoint. I also had occasion to seen him in social contexts and he was very charming and entertaining and quite adept at social dancing. 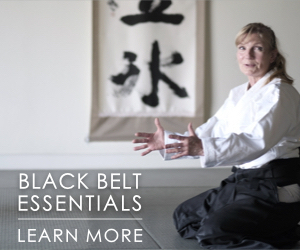 Tohei Sensei’s approach to teaching was simplicity itself. He started presenting a series of preparatory exercises done alone or with a partner designed to teach one to move in a relaxed, circular fashion. He had also developed a series of “ki testing” drills where one would check to ensure that his partner was “extending ki” properly. These exercises were a lot of fun and were something you could show to impress and mystify your friends. I remember in particular the “unbendable arm” and “unliftable posture.” Tohei Sensei taught a core of some 50 aikido techniques and each was executed in a highly individualistic way and clearly bore his stamp. He would demonstrate techniques in a casual, playful manner, as if to suggest that if one mastered the movements of aikido executing them was mere child’s play. We were taught that it was wrong to attempt to develop or resort to physical strength as this would impede our ability to learn to apply ki when executing techniques. What we were doing was in one very real sense an “unlearning” process in that we were reprogramming our bodies and minds to deal with physical reality in a new, more efficient manner. It was a wonderful and exciting experience having Tohei Sensei with us for several weeks and during that time about a dozen members of our dojo took dan examinations, myself included. I received my first dan in August of 1965 about three years after beginning training. With the approach of fall, I returned to my studies which gradually came to consume more and more of my time. I still managed to keep up aikido training, but could barely manage two days a week. In America, unlike Japan, students during their university years are required to devote themselves to academics more intently than any other period of their academic careers. Tohei Sensei visited Los Angeles again in the fall of 1967 and even though I had not been training very much due to the demands of graduate school I was told to take my nidan test on the spot without any prior warning. I felt very awkward about this as I knew I was not prepared. I still have an 8mm film of the randori section of that test and find it quite comical to watch as I almost lose the top of my keikogi during the confusion of being attacked. Somehow I was passed to nidan by Tohei Sensei on that occasion. Compared to today’s standards I think our level was lower in those days. But aikido was still a young martial art in the west and there were few experienced teachers then. 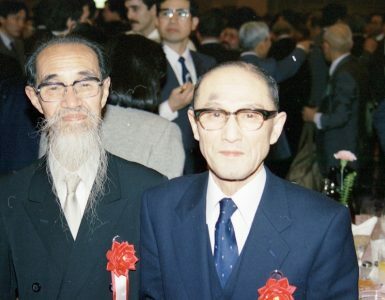 To put things into perspective, in my research in later years I learned that even the Aikikai Hombu Dojo accelerated dan promotions during the 1950s in order to develop a teaching corps. In fact some of today’s most well-known teachers were skipped one or two dans during aikido’s early years. The next year I transferred to the University of California at Berkeley to begin my Ph.D. course in Romance Languages and Literatures. This was the 1968-1969 academic year and the university was the center of great student unrest and many demonstrations and riots occurred. It was not at all an atmosphere conducive to academic study. Ironically I became much more heavily involved in aikido during that year as Dr. Robert Frager and I shared responsibility for teaching the university’s aikido club. Given the chaotic situation on campus, aikido became in a certain sense more important to me than my studies. Moreover, I made the decision to travel to Japan during the summer break in hopes of meeting the Founder Morihei Ueshiba in person. Another reason for the timing of my visit was the fact that I was to be inducted into the army in the fall of 1969. The United States were embroiled in the Vietnam war and many college students were being called to serve. Unfortunately, word reached us at Berkeley late in April 1969 that the Founder had passed away. I was greatly saddened by this event and considered postponing my trip. But upon reflection, since I had to enter the army and didn’t know when my next chance would be, I determined to make the trip to Japan anyway. My flight from Los Angeles left for Tokyo on June 23, 1969 and arrived at Haneda the next day. I took a taxi from the airport to the Aikikai Hombu Dojo and was on the tatami training within several hours of my arrival. I participated in a gasshuku session of a university club and they sent their strongest members to train with me one after another until I became worn out and had to sit down! It was quite an introduction to Japan. I had with me two letters of recommendation written in Japanese by my friend Mr. Rod Kobayashi—one for Doshu Kisshomaru Ueshiba and the other for Koichi Tohei Sensei. The letters stated that I would be training in Japan during the summer and hoped to conduct some historical research on the Founder Morihei Ueshiba. The letters asked them to look after me and lend their cooperation. Doshu was cordial enough and vaguely acknowledged my desire to conduct research. Tohei Sensei, upon his return from abroad soon after my arrival in Japan, had a similar reaction when he read my letter. I soon found a house to stay in Mitaka for the summer with the help of the dojo and settled into a routine of training. I attended Doshu’s early morning class four or five times a week, Tohei Sensei’s Friday classes and often participated in sessions conducted by Kisaburo Osawa, Seigo Yamaguchi and Yasuo Kobayashi Senseis. Yamaguchi Sensei’s aikido in particular fascinated me although I confess to being able to understand almost nothing so unique was his style. Nonetheless, I participated in his Monday evening classes faithfully and was allowed on one occasion to practice at a company dojo where he taught. I also attended Morihiro Saito Sensei’s Sunday classes and enjoyed them very much. I found him to be an amazing technician. 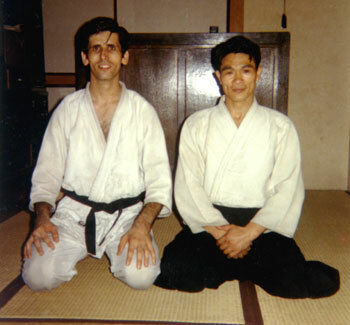 Through a friend, Tom Smith, I learned about the possibility of practicing with Shoji Nishio Sensei whom I had never met. We visited a small judo dojo in Sugamo where he instructed and I found his approach to aikido very dynamic and quite unlike anything I had ever seen. This visit resulted in my training there on Tuesday and Thursday evenings for about six weeks. The atmosphere inside the Hombu was fascinating. 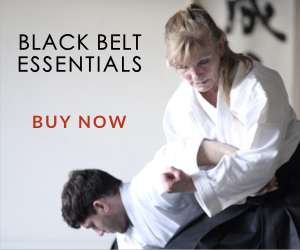 Although I was already a nidan at the time having studied aikido for seven years, I felt poorly prepared for the fast pace of training in the summer heat and the variety of styles where the same techniques were executed in fundamentally different ways. I found I was learning to mimic the styles of several teachers but had no style or technical base of my own. Also, there was a clear division in the dojo already at that time. When Tohei Sensei would teach on Fridays it was a different set of people who would show up at the dojo. Conversely, few of those who trained during the week would come for Tohei Sensei’s classes. There were deshi in the dojo who were considered under the tutelage of Doshu and those under Tohei Sensei. Everyone knew that there were strong divergences of opinion on teaching methodology and the stage for the split that was to take place in 1974 had already been set. My efforts to gather materials on the Founder met with little success. I was able to buy a few books and several back issues of the Aikido Shimbun published by the dojo, but my requests through the office to obtain copies of photographs or films led to no concrete results. Finally near the end of my stay I asked Iwao Tamura, one of Tohei Sensei’s deshi who was fluent in English, if it would be possible to ask Tohei Sensei again about helping me. As a result, I was called to a room on the second floor of the dojo late in August. Present were Tohei Sensei, Mr. Tamura and myself. I was told clearly that I was considered to be a student of Tohei student and as such was mistaken to have trained with other teachers during my stay in Japan. Tohei Sensei also criticized the Founder’s teaching methodology and said in no uncertain terms that I should focus my efforts on his ki approach to aikido. I was 24 years old at the time and emotionally unprepared to deal with such a confrontation. Totally deflated, I left the dojo almost in a trance state and wondered seriously how I could continue my aikido training having heard such words about the Founder from his top student. I returned home and set about writing a long letter to Rod Kobayashi who was close to Tohei Sensei describing in detail what had happened and asking for advice. As I reflect on the situation with the benefit of hindsight, I can to a certain extent sympathize with Tohei Sensei’s viewpoint. Within the budo context, it goes totally against proper etiquette for a student of one teacher to train with another, let alone several, simultaneously. Also, the Founder’s way of expressing himself using esoteric and religious terms to describe his aikido certainly could not be expected to be meaningful to ordinary Japanese practitioners or to foreign students of the art. Only a few days of my stay remained and I didn’t go much to the dojo. I had to reflect upon what aikido really meant for me as an individual and prepare myself psychologically for induction into the U.S. army. I left Japan rather disillusioned but the wiser for my experience there and distance and time proved to be great healers. 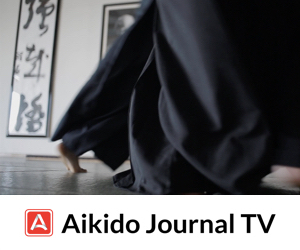 In the next article I will describe my experiences while in the military, the beginnings of Aiki News, and the separation of Tohei Sensei from the Aikikai Hombu in 1974. Thank you Stanley. As an history enthusiast I found this very interesting and thrilling. Waiting anxiously to the next chapter. Fantastic article. Thank you so much! I really appreciate your efforts in acknowledging Tohei-sensei’s importance to the world of aikido. Stanley, Through your enthusiasm, dedication, intelligence, perspicacity, and your willingness to “do the heavy lifting,” you have done the world a great service. 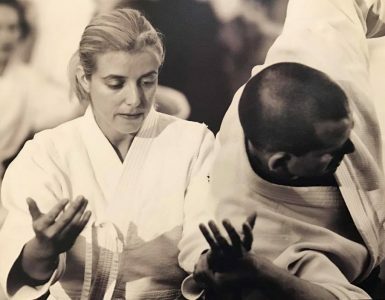 You have bridged two great cultures and have contributed to both, not just intellectually, but, through your practice of aikido, physically, as well. I am certain that your efforts will bear fruit well beyond your own lifespan, even as a stone thrown into a still pond produces ripples that extend in all directions long after the stone has disappeared beneath the waters. Congratulations, and thank you for a life well-lived in the service of humanity. Having studied with Yamada Sensei at NY Aikikai and then years later with Sensei Rod Kobayashi at his Crenshaw-district dojo in L.A., I can somewhat understand about the differences in emphasis and training between the two schools. I was saddened to recently discover that Kobayashi sensei had passed a few years ago. I have only just recently re-kindled my practice of Aikido in So. New Jersey.